Westosha Sports Complex is hosting The HitTrax Quality Hit Game (Q‐Hit), an exciting, competitive game that assess a player’s ability to make “quality” hits. What is a quality hit? There are multiple factors that go into answering this question. 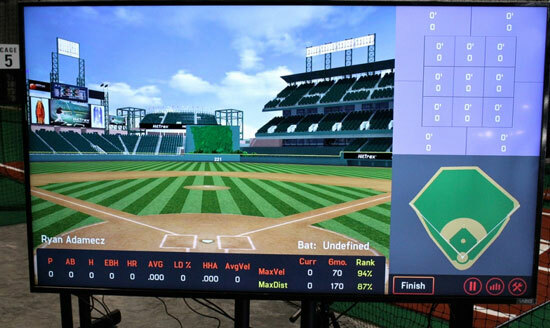 Four metrics are used to calculate a score for each hit; exit velocity, launch angle, distance, and the calculated result. Simply put, the higher the score, the better the hit. Play as many quality hit games in a 30 minute period. Ages Baseball: 8/9U, 10/11U, 12U, 13/14U, High School. Softball: 8/9U, 10/11U, 12U, 13/14U, High School. Scoring is the total of the highest 4 games. Winner in each level wins a ½ hour HitTrax gift certificate. League play is January 2nd – 31st NO exceptions. Play your games when you want, call the complex to schedule your ½ hour HitTrax tunnel. Need to cancel your reservation? No problem, call us 24 hours in advance. If you don’t make your reservation you forfeit the session. Westosha Sports Complex is located at 1215 N. Pryor St, Silver Lake.